Harry is delighted because he isn’t going to have to spend the whole summer with he dreadful Aunt Petunia, his Uncle Vernon and his cousin Dudley. This year England is hosting the Quidditch World Cup and Harry’s best friend’s father, Mr. Weasley has managed to get some tickets for himself, his children, Harry, and Harry’s other best friend Hermione Granger. Of course the match itself is fabulous but some rather unpleasant things happen after the match is over which leaves everyone feeling more than just a little jumpy. There are indications that Voldemort and his followers, the Death Eaters, are getting ready for something and people are worried. When Harry and his friends start their new term at Hogwarts School of Witchcraft and Wizardry they are soon caught up in a very exciting event which promises to make this school year unique. The Ministry of Magic and others have decided that the time has come, in the interest of international wizarding cooperation, to bring back the Triwizard Tournament. 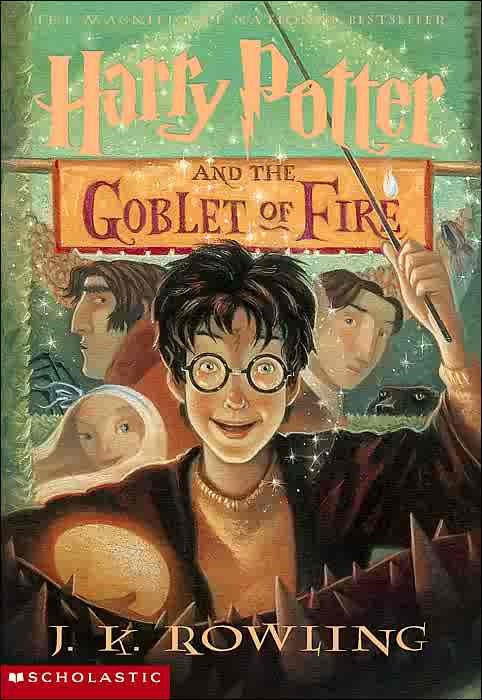 A special magical cup called the goblet of fire will choose who will compete from each of the three wizarding schools. The names of the potential contestants are placed in the goblet which then is supposed decide who will compete, one person being selected from each school. When the time comes however, four names appear out of the cup and one of them is Harry’s even though he is two young to be competing. Though everyone is confounded as to how this sort of thing could have happened, there is nothing that can be done and Harry must compete, even though the three students he will be competing against are older than him and even though the three tasks promise to be very difficult indeed. Harry and his friends cannot help thinking that someone out there is trying very hard to get Harry killed. This gripping, and at times deeply disturbing fourth book in the Harry Potter series will have readers staying up all night reading to find out what is going to happen next. There is no doubt that Harry is in a very difficult situation and it does not help that he has started to notice pretty girls for the first time. Growing up is never easy but it is infinitely worse when a dark wizard is trying to destroy you and when you are facing three tasks which promise to be both dangerous and magically challenging.